The Le Mans break came to a close for the IMSA Weathertech Sportscar Championship contenders last weekend when they got together at Watkins Glen for what was a thrilling and dramatic six-hour-long race. It was of vital importance, as it was the sixth round of the IMSA calendar and, on top of that, the third in the coveted North American Endurance Cup. As such, all four classes were present, all eager to grab the points that were on offer at the three-hour mark and at the end. 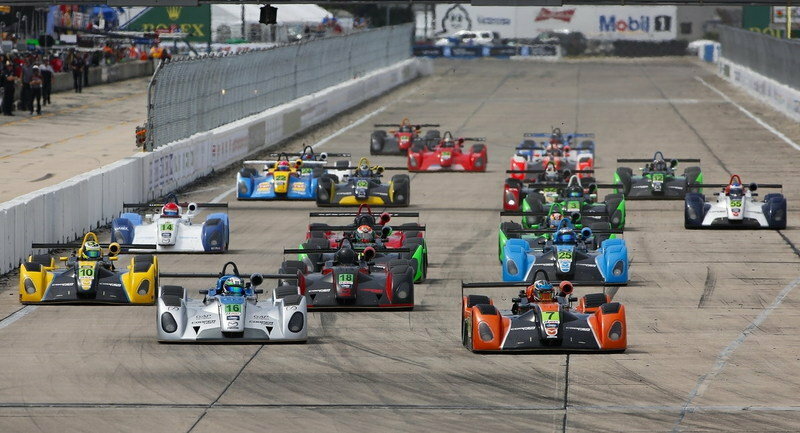 Extreme Speed Motorsport kept their promise of doing the entirety of the NAEC and returned with a single Honda-powered Ligier, which previously saw victory at Daytona and Sebring. Ford also rejoined its GT-LM rivals after a flawless Le Mans weekend that saw the Chip Ganassi-run operation claim top honors in the GTE-Pro category. Watkins Glen itself looked way different than it did 12 months ago as it greeted the racers with grippy, fresh asphalt that was a certain ticket to new lap records – both in qualifying and during the race. 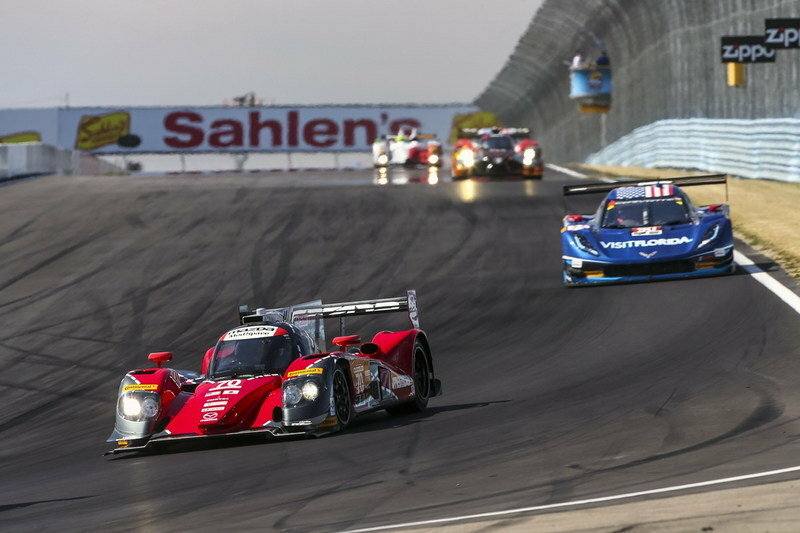 The nature of Watkins Glen was seen as one that would rather favor the LMP2 machines, of which there were four – the two Ligiers and the Mazdas. These cars did prove their speed in qualifying by locking the front row of the grid for Sunday’s event but it was the same old story all over again as multiple yellows in the final 90 minutes helped the Corvette DPs which, being heavier, can get the tires up to operating temperature faster. It was a real tour de force for Johannes van Overbeek in the Patron Tequila-sponsored, ESM-entered, Ligier JS P2, which clocked an unbeatable 1:35:207 on the 3.4-mile road course in Saturday’s 15-minute-long qualifying. Tristan Nunez came close to snatching the pole from under van Overbeek’s nose but fell short by just 0.167 seconds, with his Multimatic-built Mazda putting up a 1:35:374 lap time. This car caught the attention of everyone on attendance long before qualifying as the No. 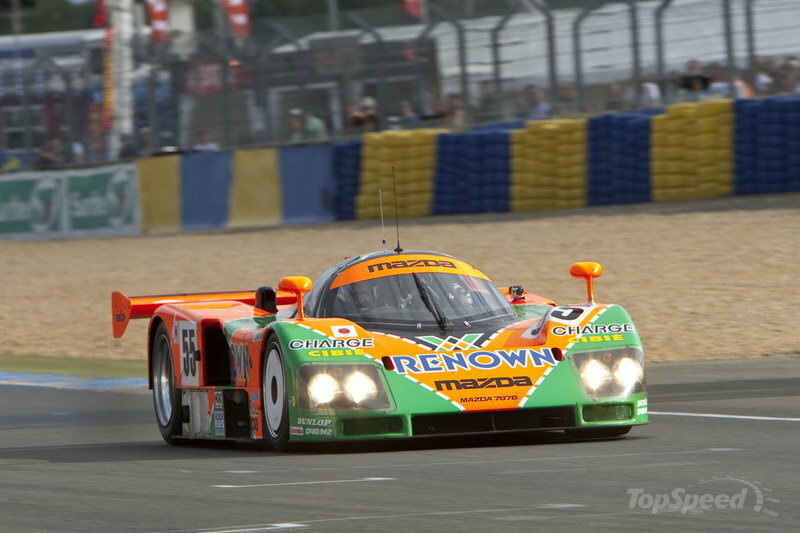 55 sported a throwback livery identical to that sported by the 1991, Le Mans-winning, Mazda 787B. Sadly, the gas-powered engine sounded nothing like the Wankel in the original, but the livery more than did it for race fans. The quickest DP slotted in fourth, next to Oswaldo Negri Jr’s Michael Shank Racing Ligier, while the two Action Express Racing Corvettes put up the fifth and sixth best times. Sadly, the Highway To Help Riley did not make it to the start, although it did turn laps in qualifying. Westbrook posted a record 1:41:301, which was more than 3.5 seconds quicker than the previous lap record set by Andy Priaulx in 2014. 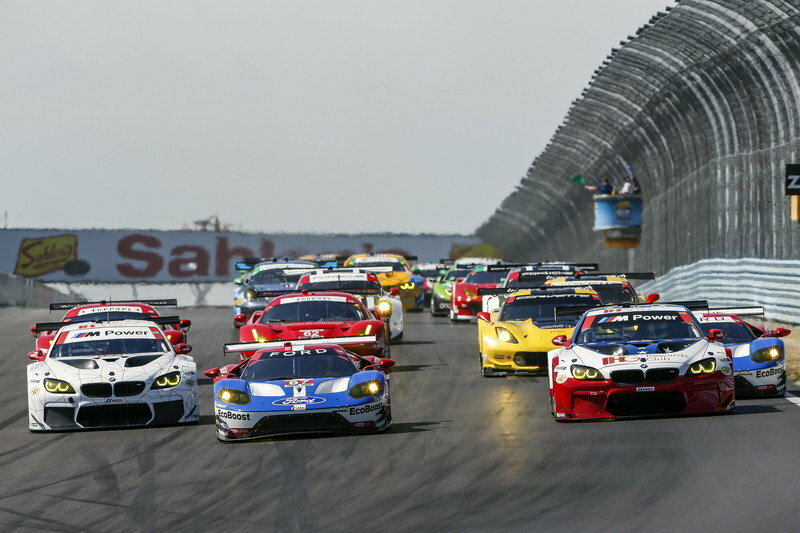 GT-LM qualifying saw Ford only challenged for pole by the Rahal Letterman Lanigan Racing-entered BMW M6 GTLMs. The German-built cars have finally come to grips with the WEC-spec GTE tire offered by Michelin and performed great on Saturday, especially the No. 25 of Dirk Werner, which also sported a throwback livery, albeit that of a more recent original – the 2001 Petit Le Mans-winning BMW M3 GTR entered by PTG. Westbrook posted a record 1:41:301, which was more than 3.5 seconds quicker than the previous lap record set by Andy Priaulx in 2014. Werner’s best effort was a 1:41:650. Renger van der Zande and Mario Farnbacher were the polesitters in LMPC and GT-D, respectively, the latter inheriting the pole after Robin Lidell’s time was erased because the Stevenson Motorsport R8 LMS failed the post-race tech inspection. Both of these times were qualifying lap records as expected. The six-hour race was held under sunny skies, the ESM Ligier leading the way multiple times in the first half, often ahead of the No. 55 Mazda driven brilliantly by Tristan Nunez, who did a two and a half-hour-long stint, and Spencer Pigot. Sadly, all their effort was for nothing as the car expired with apparent turbo-related problems with only 31 minutes to go while running third. The other Mazda managed to come home a disappointing fifth due to trouble earlier during a pit stop when Ben Devlin set off while the fueling hose was still attached. ESM didn’t have it all their way either, despite Pipo Derani snatching the lead from Joao Barbosa one minute before the half-way mark to score the maximum five points awarded at that point. The car, which was leading with little over 70 minutes until the end, was retired by Derani after it stopped in the Inner Loop. This left Marc Goossens to take the lead, who also faltered in the latter stages. He spun last year’s winning No. 90 VisitFlorida.com Racing Corvette DP with only 33 minutes left and needed a tow truck to get going again. The incident caused one of the four caution periods that marked the final 90 minutes of the event. The finishing order was decided on the last round of pit stops where the No. 5 Action Express crew was quicker, with Dane Cameron exiting behind team-mate Joao Barbosa. The Portuguese was able to take the victory with ease as Cameron also had to cope with pressure from behind, MSR’s Olivier Pla having reeled him in over the course of his last stint. Pla was unable to pass the No. 31 Whelen Corvette and had to settle for third. The result pushes Barbosa and Fittipaldi to the top of the driver’s standings in both the NAEC and the IWSC. The ESM crew is second in NAEC while in the IWSC the battle is tight between Dane Cameron, Eric Curran and the Taylor Brothers. LMPC saw Renger van der Zande march to the front of the pack during a storming final stint to score the second victory on a trot for Starworks Motorsport. Behind him was Performance Tech’s Kyle Marcelli who edged ahead of Starworks’ other car driven to third by Richard Bradley. Peter Baron’s team moved ahead of Performance Tech in the second-to-last round of pit stops. The JDC-Miller Daytona-winning car finished fourth in the hands of Stephen Simpson. The class was marked by major drama, first with Johnny Mowlem’s heavy accident following a clash with the BAR1-entered ORECA early in the race. Then came CORE Autosport’s retirement after an overall lackluster race. The turbo-engined Fords paced Watkins Glen to take a 1-2 win over BMW, albeit in rather controversial fashion as Joey Hand moved past Bill Auberlen for second in the final minutes using the asphalt run-off. The rules state that you cannot leave the track to gain an advantage but, in spite of this, Hand was not penalized and went on to finish behind team-mate Richard Westbrook. The Fords were both quicker on pace than the BMWs and more fuel efficient over the six hours. If this race and the one at Le Mans is an indication for the status quo over the remaining races in the IMSA championship in 2016, then we should see quite a lot of unhappy faces in the paddock after Petit Le Mans in October. The first naturally aspirated car was the No. 4 Corvette of Milner and Gavin who put together a perfect race, which kept them at the head of the NAEC driver standings, albeit at a hair’s length from a number of rivals from Porsche, BMW and Ford. Talking about Porsche, their weekend was disastrous, plagued by lack of pace and on-track mishaps, as was Ferrari’s considering the 488s couldn’t place better than fifth and sixth, despite Scuderia Corsa leading the race at some point. It’s interesting to point out that, just like at Le Mans, the Fords were able to pull qualifying-like laps whenever they wished, Joey Hands’ 1:41:141 lap record being fractionally slower than Richard Westbrook’s pole time. Christina Nielsen, Alessandro Balzan and Jeff Segal scored another victory in GT-D, thus consolidating their lead in the championship after an exemplary comeback drive. The team had all but given up on their chances of victory after Nielsen came crawling back to the pits during the second hour due to the failure of an engine sensor. Once that was fixed, Segal and Balzan went out to pace the track, running at a pace that proved it to be the quickest car of the weekend. The GT-D field was marred by questionable punctures, many on the left-rear tire. One of the teams that suffered such a misfortune was Magnus Racing, but the No. 44 of Andy Lally, John Potter and Dion von Moltke fought back to come home second ahead of the AJR/Team Seattle Porsche of Mario Farnbacher, Ian James and Alex Riberas. The Gas Monkey No. 33 Viper came home fourth, Jeroen Bleekmolen stating this was the best they could do considering the “unsatisfactory” BoP that saw the Riley-built Viper roughly a second off pace. Despite showing promise in qualifying, the Lamborghinis failed to deliver, as was the case for the Turner Motorsport BMWs that spent much of their time off track with many issues. Next up on the IMSA Weathertech Sportscar Championship schedule is the Canadian Tire Motorsport Park (Mosport Park) round this coming weekend.